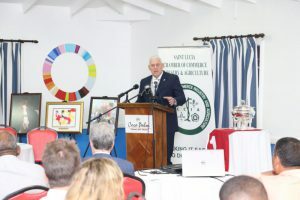 Saint Lucia Prime Minister Honourable Allen M. Chastanet gave an extensive and passionate presentation to the Saint Lucia Chamber of Commerce on Thursday November 15th 2018 as he addressed a packed room of members of the local business sector. The broad discussion touched on a variety of areas including infrastructure, health care, education and economic development. The Prime Minister began by updating the Chamber on current and proposed development projects for Saint Lucia, starting from the north to the south of the island. Among the projects: the planned expansion of major hotels in the Rodney Bay and Gros Islet area, new tourism projects for the Choc area, the expansion of Saint Lucia Distillers, the construction of the Fairmont Hotel in Choiseul and the DSH Pearl of the Caribbean Project. The Prime Minister also spoke to critical public sector projects such as the redevelopment of Hewanorra International Airport, the redevelopment of Castries, rehabilitation of road infrastructure, social programmes and efforts to address the nation’s security. “We have come to an agreement with the Taiwanese Government who have agreed to lend us 100 million US dollars to be able to do that project,” explained the Prime Minister, while also adding that the loan is being supported by the airport development charge. An additional $50 Million will be borrowed from Taiwan for major upgrades of existing roads island-wide. The Prime Minister noted that the road rehabilitation charge on gasoline will also be used to service the loan. When it came to health care, the Prime Minister updated the business community on plans for National Health Insurance, the strengthening of the nation’s primary health care facilities and the phased opening of the OK-EU hospital. With regard to the construction of the St. Jude Hospital the Prime Minister said the designs and the engineering drawings have been completed and funding has been secured for the proposed new wing. “We are moving as fast as we possible can to rectify that situation,” PM Chastanet said following a recap of the immense missteps which had led the nation to this point. “We know the challenges that exist at the stadium and we are working with the staff as best as we possibly can to make them as comfortable as possible, but we recognize and understand the frustration by both the people who are working there, as well as the citizens who have to depend on it. The fact is we have to do things the right way and I can assure all Saint Lucians that you will be very proud of the development. I am comfortable that once you have all the financing, you have the design completed and you have a great company doing the implementation that you should not see a repeat of what happened the last five years. The Prime Minister also said that the Government tackling issues concerning the pace of the implementation of programmes and projects and has engaged the Performance Management and Delivery Unit (PEMANDU), which was set up by Malaysia, to assist Saint Lucia in that regard. PEMANDU will be focused on six key areas of Agriculture, Tourism, Infrastructure, Health, Education and Social Development. Key indicators in the economy have been encouraging, said the Prime Minister, noting that tourism continues to show signs of growth and consumption and economic activity is on the rise. Also encouraging, said the Prime Minister, was growth in the Information Technology sector which has seen the creation of 2000 new jobs. He singled out the expansion of KM2 and OJO Labs. The Prime Minister also spoke about the National Apprenticeship Programme and the partnership with Monroe College which will see hundreds of Saint Lucian young people receive hands on hospitality training. “We continue on course and I am very encouraged,” said the Prime Minister about overall development. “The amount of money that is about to start flowing into this economy and the investment that we are going to be making into the infrastructure of this country . . . there is a lot of work taking place on the ground and we are moving. What we are focused on is developing this country, improving the physical capacity, improving the human capacity and improving the bureaucratic capacity of this country. As he closed his presentation, which included questions from the attendees, PM Chastanet explained that the plan of Building a New Saint Lucia where all can benefit is the priority.